The Bear is a major character in Navajo and Zuni legend, in which he is awarded the attribute of being a great thinker. The reason behind this is that in the wilds the Bear spends the entire Winter in hibernation, considering the year's experiences, and is thus said to have profound inner knowledge. The Bear is also considered exceptionally powerful because he can stand on two legs like a man and thus it is also said that he is a good mediator between the animal spirits and humans. In this exquisite talisman, the bear has been hand-carved in the Design Studio by a famous craftsman called Everett Pino, from semi-precious materials found on the reservation in New Mexico. Each bear is unique, but typical materials used in the design are turquoise, black onyx, jasper, adventurine, smokey quartz, obsidian, lapis lazuli, moonstone, carmenite and many others. 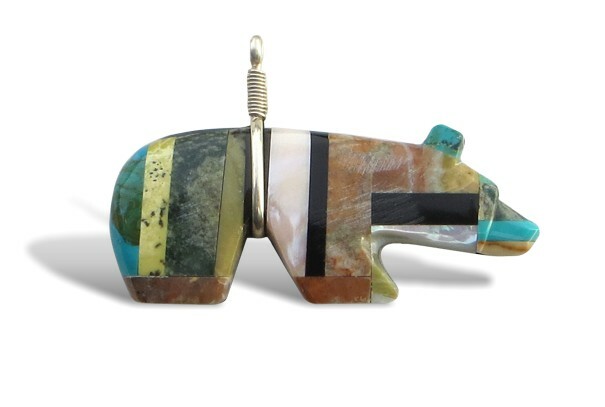 Funky, chunky and very beautiful , the Zuni Bear pendant is thick, sturdy and destined to become a family heirloom and is finished in Sterling Silver with a 20" Ball Chain. (Call 020 8444 4541 if you require a longer or shorter chain).